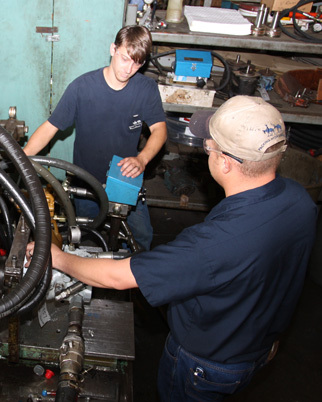 At Hydropower we sell and service all makes and models of hydraulic equipment, components and accessories and have an extensive local inventory for immediate availability. One of nineteen Master Distributors in the United States. Standard cylinders, valves, pumps, and accessories including the Wolverine line of cylinders, valves, motors and other accessories. Directional valves, subplate mounted for industrial and mobile applications, UFI pressure filters, and many other components. Low speed high torque hydraulic motors. Pneumatic, hydraulic NFPA, spring, underwater, self-lubricating, cylinders of all types. Creative answers to difficult cylinder environments. Gear pumps and motors, blowers and accessories. Rams, spreaders, presses, cylinders, air pumps, hand pumps, jacks, combination sets, and accessories with pressures up to 10,000 psi for construction and OEM markets. Brass. Stainless steel, steel, and plastic quick couplings for hydraulic, pneumatic, and fluid applications. Ball valves, checks. Single and double acting telescopic cylinders. The world’s finest. Dry. Faster. Longer lived. World’s largest manufacturer of multistages. Hydraulic hose, hose ends and assembly equipment, tube fittings and a full range of support accessories. Get German-engineered original replacement parts direct from the USA. Flow controls, needle valves, and check valves. Reggiana planetary gear reducers, wheel drives, brakes, slew bearings, rotary manifolds, worm, parallel, right angle and concentric reducers, and industry interchanges. Please contact us if you do not see the specific brand you require. Hydro/Power Mississippi is committed to resource any product to solve your fluid power needs. If you need it we’ll get it.